As thought leaders, we want to create positive change and forward momentum. But in order to do so, we’ve got to stop hiding behind “shoulds” and false versions of ourselves. The more we embrace our stories, our realness, and our values, the more we’re able to create positive impact. Which is why we talk in this episode of Leadership Forum all about finding your thought leadership voice, why this is a benefit, how to overcome the objections and fears keeping you from getting vulnerable with your voice, and actionable steps you can take today. When thought leaders find and embrace their voice, they’re able to create the change they want to see in the world. That’s because people want to hear real stories, real experiences, real teachable moments. They want to see the humanity in the people they learn from and are inspired by, because they want to reach those places as well… and if it feels impossible, it can be easier to give up. When we find our voice, we’re able to move through situations that stifle our creativity and purpose. We can remain true to our values and vision. In addition, we’re able to stand out — and it’s a crowded world out there, so this is definitely a good thing! Beyond this, finding our voice enables us to attract the right people who want to be part of our community, and we can create a platform that’s sustainable and feels good for the long haul. Fear causes us to tell ourselves false stories around our voice, and it holds us back in so many ways. We’re afraid of being wrong, of responsibility, of having no followers, of being hated, of being alone, of not being able to handle it… and so much more. Yet when we move past the fear, our power is immense. Some of the ways we can move past the fear are to remain grounded in our values, gain perspective on the fear, bear in mind our goals and objectives, and take small steps forward (and celebrate them). 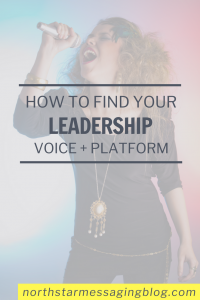 A lot of it comes down to trusting the process and practicing, but there are some actionable steps you can take today to get clearer on your voice as a thought leader. Get our free Brand Your Voice guide here! Write in the comments to let us know how you’re overcoming fear and embracing your voice as a thought leader.